Kinzer is a senior fellow at the Watson Institute for International and Public Affairs at Brown University. His books include Overthrow: America’s Century of Regime Change from Hawaii to Iraq and most recently, The True Flag: Theodore Roosevelt, Mark Twain, and the Birth of American Empire. He recently wrote the piece “The Folly of ‘Russiagate’” for the Boston Globe: “As long as Clinton and those who followed her off the electoral cliff believe [Russiagate], they can avoid self-criticism and blame someone else for her loss. 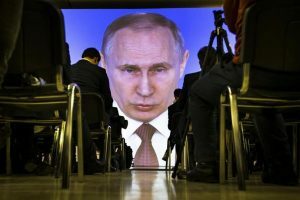 Best of all, years of relentless attacks by American pundits and politicians have turned the person they want to blame — President Vladimir Putin of Russia — into a caricature of evil. That made it possible to imagine Putin as powerful enough to decide the outcome of a presidential election in the United States. Mueller’s report is a rude shock to those who dove down this rabbit hole.